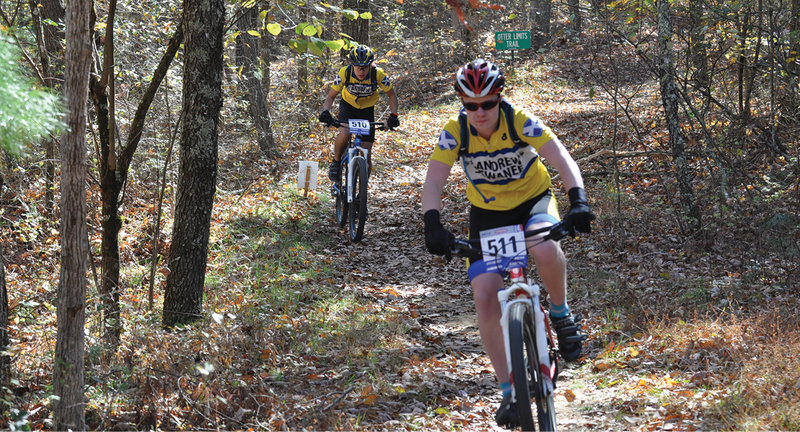 The National Interscholastic Cycling Association (NICA) brings the final of four 2015 Tennessee High School Cycling League mountain bike races to the St. Andrew's-Sewanee campus on November 8 from 10 a.m. until 2 p.m. This is the State Championship event for both high school and middle school competitive mountain biking teams. The course is set on a rigorous 4 1/2-mile lap featuring a sustained climb of just under a half mile and many technical sections. Girls' and boys' school teams will compete with total race distances ranging from 4 1/2 to 18 miles. Teams from throughout the state, including St. Andrew's-Sewanee, Memphis, Collierville, Nashville, Franklin, Chattanooga, Knoxville, Sevierville, Mt. Juliet, and Marshall County Kentucky, will bring about 150 riders and their families to Sewanee for the weekend. The league now has 12 teams, 188 riders (115 High School and 73 Middle School) and 58 coaches. Founded in 2009, the National Interscholastic Cycling Association (NICA) develops high school mountain biking programs for student-athletes across the United States. NICA provides leadership, services, and governance for local leagues to produce quality mountain bike events and supports development of every student-athlete. Spectating is exciting and easy at the open start/finish area in the front fields of campus and from many other vantage points throughout campus and on course. For more information, visit the League's website at www.tennesseemtb.org.